This product will not be produced again, and will be discontinued once it runs out of stock. It's possible that exceptions could be made for high-volume customers. Contact sales@phidgets.com to discuss options. For measuring platinum RTDs, you should consider using the TMP1200 instead. The 1134 - Switchable Voltage Divider is an adjustable resistor used to create a voltage divider with a variable resistance sensor. The 1134's resistance can be tuned to be close to the resistive sensor by flipping the dip switches on the board. The individual resistance values available (in Ohms) are 249, 820, 2.61K, 8.45K, 27.4K, 91K, 300K and 1M. It is possible to have multiple switches flipped which puts the corresponding resistors in parallel. 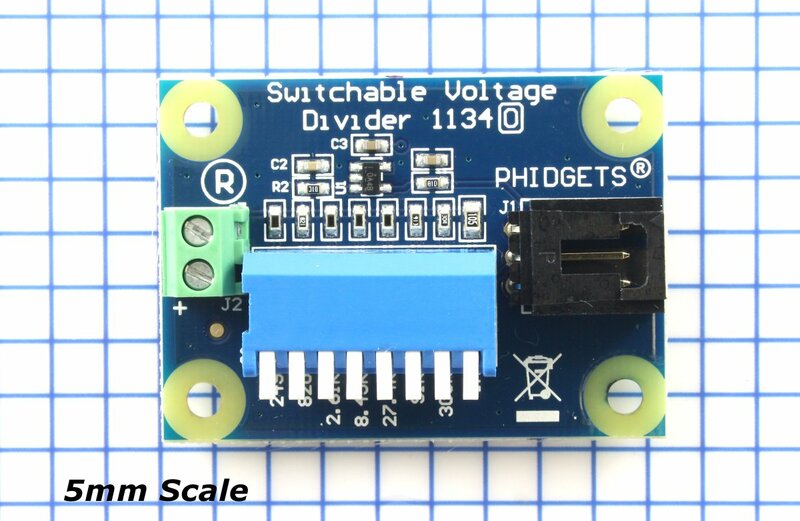 The 1134 Provides an interface to non-Phidgets variable resistance sensors such as: Force Sensing Resistors (FSR), light sensors, thermistors (heat sensors), and bend sensors. 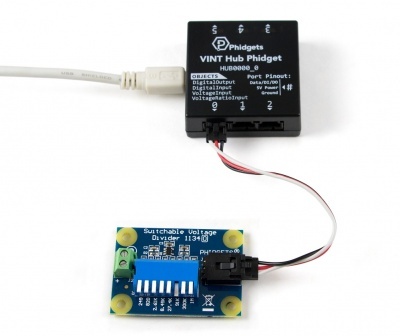 This sensor can be read by any Phidget with an Analog Input or VINT Hub port. It will connect to either one using the included Phidget cable. VINT Hub ports can behave just like Analog Inputs, but have the added flexibility of being able to be used as digital inputs, digital outputs, or ports to communicate with VINT devices. For more information about VINT, see the VINT Primer. 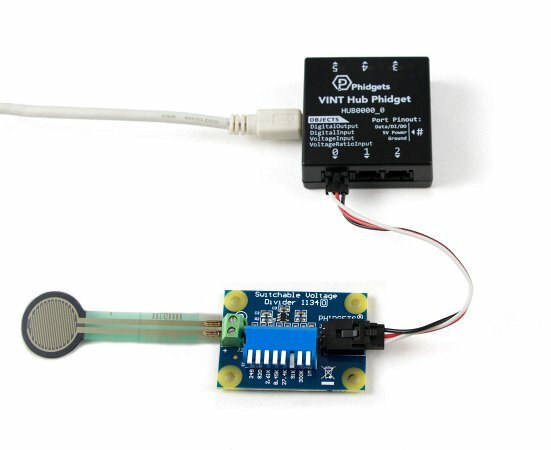 This sensor comes with its own Phidget cable to connect it to an InterfaceKit or Hub, but if you need extras we have a full list down below. You can solder multiple cables together in order to make even longer Phidget cables, but you should be aware of the effects of having long wires in your system. Any Phidget with a Voltage Ratio Input port, here are some compatible products. We will be using the HUB0000 for this guide. Connect the 1134 to the HUB0000 with the Phidget cable. 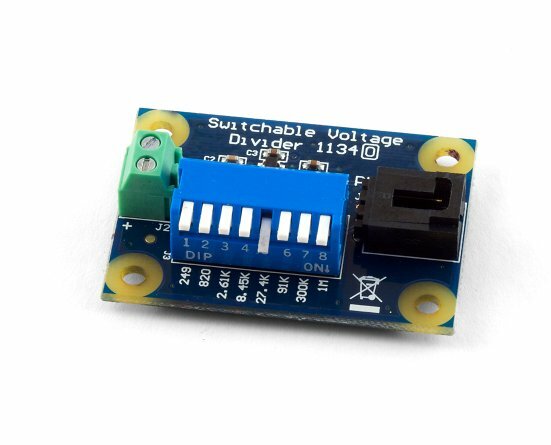 Connect a variable resistance sensor to the terminal block on the 1134. Select an appropriate measurement range for your application by toggling the desired DIP switch. We are toggling the 27.4K switch. When the switch is down, the associated measuring resistor is selected. It is possible to have more than one switch toggled and have the resistors in parallel. Connect the HUB0000 to your computer with the USB cable. Now that you have everything together, let's start using the 1134! 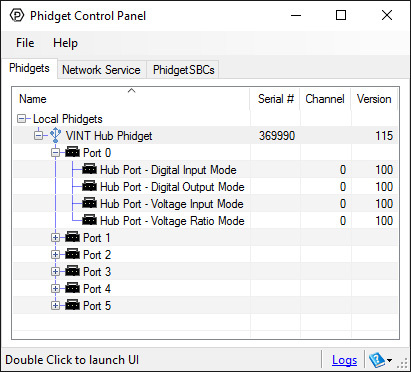 In order to demonstrate the functionality of the 1134, we will connect it to the HUB0000, and then run an example using the Phidget Control Panel on a Windows machine. Linux users can follow the getting started with Linux guide and continue reading here for more information about the 1134. Select the 1134 from the Sensor Type drop-down menu. The Sensor Value will now return a value between 0 and 1. 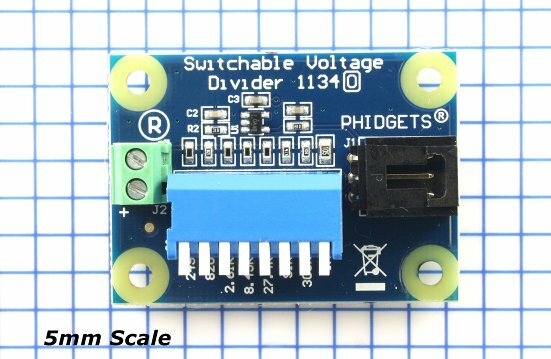 The 1134 is a voltage divider with switches. The switches can be used to control which resistors are used in the voltage divider. From left to right, the resistance values (in Ohms) are 249, 820, 2.61K,8.45K, 27.4K, 91K, 300K and 1M. It is possible to have multiple switches flipped, putting the corresponding resistors in parallel. Where Req is the equivalent resistance of the switches that are flipped on in Ohms. The Switchable Voltage Divider has an internal buffer on the output. This allows the output to be read without distortion caused by the device reading the measurement, such as the HUB0000 (or compatible product). To optimize the 1134 to meet your needs, you have to adjust the switchable resistance to match the characteristics of your chosen variable resistor. First, adjust the resistance for no stimuli on your sensor, then apply maximum stimuli and make sure that the voltage stays within a range that gives you an acceptable resolution. The formula is most accurate at a voltage of 2.5V, with an error of 0.4%. At 0.5V and 4.5V, the error increases to approximately 1.1% and at 0.25V and 4.75V, it increases to 2.1%. 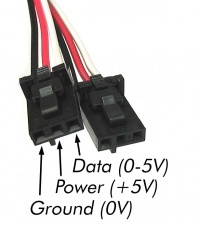 As a general rule, if the voltage is over 4.5V, a lower resistance should be switched in. If the voltage is below 0.5V, a higher switch should be toggled. Continue adjusting the switches until you find an acceptable range. Warning: It is possible for the 1134 to apply up to 5V to the variable resistor. If the resistor cannot handle this voltage, it can be damaged. 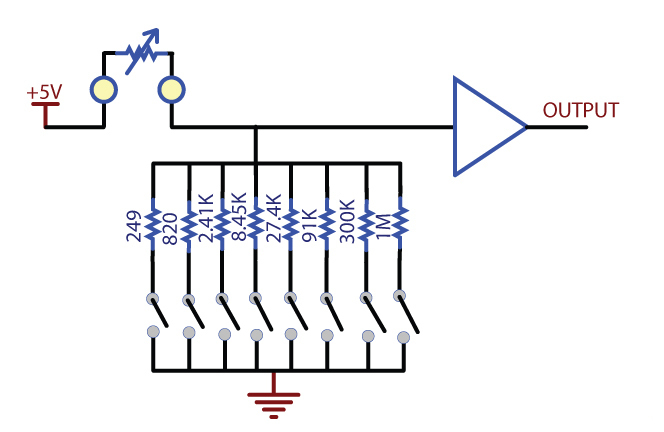 The 1134 is a very simple way of measuring resistance. When interfacing to sensors with small resistances (like 100Ω RTDs, for instance), large currents can flow - up to 30mA. This level of current may cause substantial heating in the variable resistor, distorting the measurement or even possibly permanently damaging it. Here are some interesting variable resistance sensors that could be used with the 1134. The Phidget Cable is a 3-pin, 0.100 inch pitch locking connector. Pictured here is a plug with the connections labelled. The connectors are commonly available - refer to the Analog Input Primer for manufacturer part numbers. This device doesn't have an API of its own. It is controlled by opening a VoltageRatioInput channel on the Phidget that it's connected to. 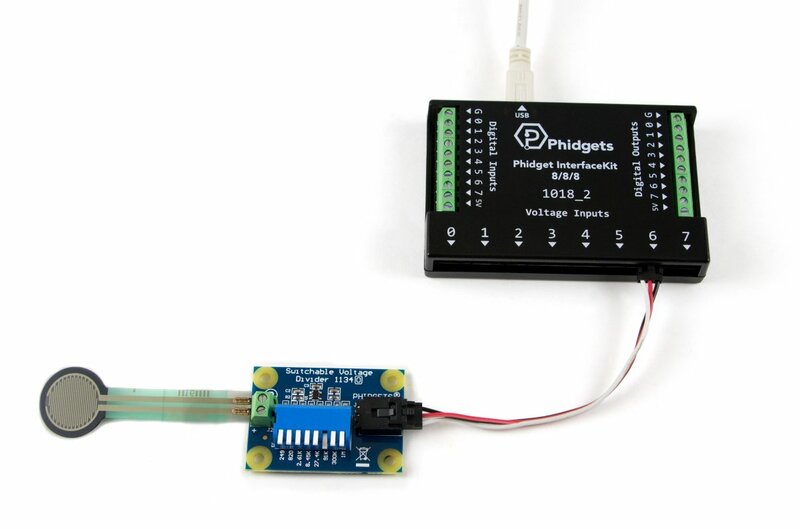 For a list of compatible Phidgets with VoltageRatio Inputs, see the Connection & Compatibility tab. 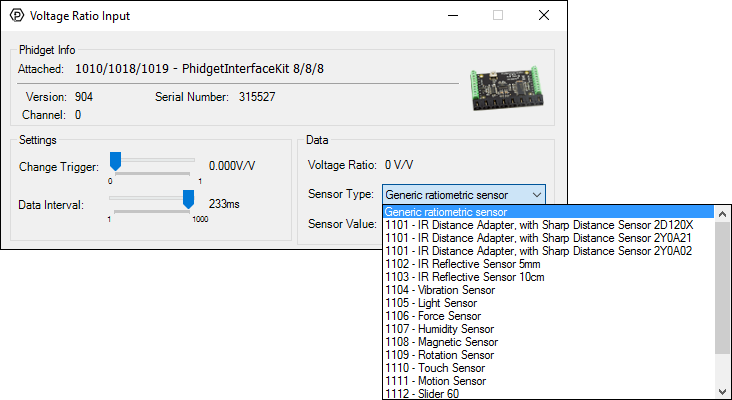 You can find details for the VoltageRatioInput API on the API tab for the Phidget that this sensor connects to.